Every year, the Super Bowl gives rise to a phenomenon like no other: Super Bowl ads. With the power to expose their brands to millions of attentive consumers, it’s no wonder advertisers have spent a staggering $5.4 billion on Super Bowl spots since the first big game 52 years ago. This year, brands paid upwards of $5 million for a single 30-second commercial according to the American Marketing Association, and yet, big advertisers like Honda and Wix chose to pass on game day ads this year. While TV’s influence on brand awareness is undoubtedly huge, this leaves us wondering: Does spending major ad dollars on Super Bowl spots have an impact on consumer foot traffic after the game? To find out, GroundTruth evaluated foot traffic in the month following the big game, focusing on top-spending advertisers in the automotive category. With one of the largest brick-and-mortar footprints, these brands represent the ideal subjects for our research. We then analyzed whether or not the decision to invest in a Super Bowl commercial impacted consumer behavior and increased foot traffic to dealerships. You may be surprised by what we found. For the purposes of our research, we compared the top brands that ran Super Bowl spots in 2018 — Lexus, Hyundai, Kia, Toyota, Jeep, and Ram — to the top brands that did not run Super Bowl ads — Audi, Honda, Mercedes-Benz, GM, and Ford. What we discovered is that this form of TV advertising did not have an immediate impact on foot traffic for the auto brands that advertised this year. In fact, the Super Bowl event itself didn’t have much of an influence on the brands that sat out, either. 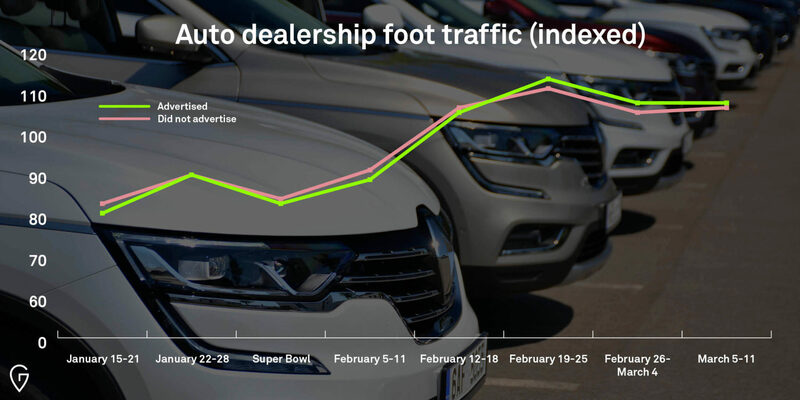 While we did see foot traffic to auto dealerships gradually increase following the Super Bowl, the difference in foot traffic behaviors for advertisers versus non-advertisers amounted to a maximum 2% spike over the time period we analyzed. That spike also happened to land on Presidents’ Day (February 19th), one of the most popular weekends for car shopping thanks to cost savings deals. In fact, promotions related to Presidents’ Day appear to have boosted store visits by an average of 13% during that week. While a 2% spike is still significant, it’s difficult to prove that Super Bowl ads had a direct correlation to the increase we observed. What we do know from this analysis, however, is that people aren’t rushing to their nearest dealership after being exposed to a game day ad — but that’s not to say it couldn’t have had an impact on which dealership they ultimately chose to visit. When your goal is to get people through the door — bigger doesn’t always mean better. In the evolving retail space, where brands like Toys ‘R’ Us are closing their doors and online retailers like Warby Parker are establishing physical locations, traditional forms of advertising like TV may not be delivering on all the business outcomes you’re looking for. While TV may win in terms of brand exposure and consumer reach, hyperlocal digital advertising like search and location-based marketing can drive actual performance-based metrics like downloads, stores visits, and sales. We predict that many advertisers will be thinking more and more about their ad buying strategy in the months to come. Running a Super Bowl spot may be a tradition for many brands, but it may not deliver all the real-world results they’re looking for. Check out our blog for more insights on foot traffic trends and their place in your marketing plan. Ten years ago, it wasn’t unusual for automotive shoppers to visit up to 10 different car dealerships when making a purchase decision. Today smartphones have fundamentally shifted the auto consumer journey.